Peter Sammons wrote The Birth of Christ, The Empty Promise of Godism (about multifaith-interfaith), One Flesh, and Rebel Church. A Baptist, he lives in Suffolk, UK. The world cries out for peace. What does Jesus teach about true peace and how it is attained? Every politician seems to announce peace, as the jacket blurb says: "it's on every politician's job description". Some promise a roadmap to peace. Are they being honest or realistic? What is the biblical pattern for peace? What did Jesus specifically say about peace? What does the Bible say is the eschatological outlook? Christians need to be open and honest about this singularly important subject, not raising false hopes but rather presenting a good news that does lead to profound peace -- both in this world and on into eternity. Who is the Prince of Peace? What is the City of Peace? And why is Jesus not known as the King of Peace? These and many other key questions are explored in this valuable book. George Tadrous comments: "The world is desperate for true peace – a shalom that will stand the test of time. This book explores why true peace is so lacking, and highlights the last best chance for all of us to gain that wonderful – and elusive – quality." Christian believers who want to get a better understanding as to why, sometimes, it is the innocent who suffer and have peace denied to them. Suitable for non-Christians who want to gain an insight into the Christian meta-narrative. A good introduction to the gospel message. Peter Sammons' “The Prince of Peace” (Glory to Glory Publications, 2015; pp.137) is aimed at the general readership, readily accessible also to those without any prior knowledge of the Bible. Peace is here understood in the wide terms of the Hebrew word 'shalom' (peace, wholeness, wellbeing, salvation etc.) and finds its focus and fulfilment in the person of Jesus Christ, the Messianic Prince of Peace. This understanding enables the author to explore, in a semi-conversational style, a wide range of Bible-teaching – salvation and Gospel, Jews and Gentiles, Israel in the purposes of God, other religions, world peace, and eschatology (including Jerusalem/ Zion). As such it is a little 'body of divinity' which introduces the reader to the Gospel, the Bible and Christian theology. For the more theologically literate Christian, the book is also of interest in that it clearly grows out of the conviction that Replacement Theology distorts the place of Jew and Gentile in the integral meta-narrative of Scripture. This holistic stance provides a key to Biblical end-time prophecy where there is often confusion over what applies to the Jews and what relates to the so-called “new Israel of God”. 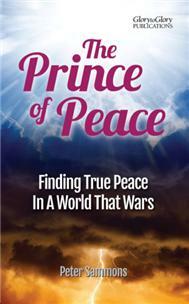 “The Prince of Peace” should appeal to both the serious seeker and the thoughtful Christian alike. Rev Dr David M Moore, December 2014. This book was also reviewed on Prophecy Today UK. Also available as a free PDF to download.